In my ever-so eager anticipation for autumn, I jumped in on the shearling trend and got these lovely fold-over faux sheepskin ankle boots. They're a size too big but it doesn't bother me in the slightest because they're soo comfy! Problem is I can't wear them outdoors just yet because they need water-proofing :( but for now they'll do for romping about the house. Excuse the randomness but I'm all hyped up on cheesecake and macaroons, mmmm, macaroons.... ok, I'm snazzing out of it! I wasn't too fond of it at first but they're really growing on me - the chunky knits and knee socks are especially adorable. I absolutely can't wait for autumn now, and unleashing my autumn wardrobe onto the blogosphere, tehe. cute boots! i love the zara lookbook. that second look is very marni resort to me.. looove it. Ooh I love your shoes! 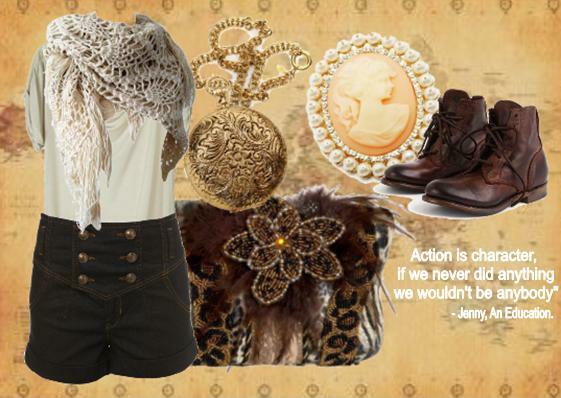 And the polyvore outfit you made! AND the Zara lookbook pics! ooh i love those boots. i wish i could wear such tall shoes!! Over the knee socks and ponchos are so gonna be a fall staple for me. I can't wait. I love your polyvore thing, especially the quote. I looove Zara's autumn lookbook, and your boots are so cute! i love a wedged boot, great buy! hey, those boots are amazing! pretty please ring me! ive been trying u but not getting through, hope ur ok.
those boots are so cute and cozy! and zara's lookbook is making me wish autumn would come faster. ahhh those boots are perfection - sorta like wedgers crossed with uggs, yes please! omg i love the new zara lookbook. and those boots u got are cute! in regards to your question, it's ok if you dont have any retail experience. I didnt have any either when I applied at first. I think big chain stores don't really mind if you have experience or not. It's pretty easy to learn on the job. I was kinda scared on the first day, but the coworkers really help you out and make you feel welcome. I did learn a lot of good, invaluable skills. Helping customers helped me break out of my shell.